The quest for soft, luxurious and healthy hair seems like a never-ending journey! I've tried high end products (usually gifted by generous hair dresser friends) such as Wella, Bumble&Bumble and Joico K-Pak and while I've had satisfactory results, I didn't really feel that it was worth the high price when compared to some drugstore finds. While browsing at Target one day I spotted the new Suave Keratin Infusion Shampoo. I bought just the shampoo since the conditioner spot was empty and continued to use the economy size Wella conditioner I'd bought at a wholesale hair supply store. I was surprised at how just the shampoo left my hair feeling! My ends are definitely in need of a hair cut (I have an appointment set for 2 weeks!) due to having gone thru an ombré stage. After searching nearly everywhere (CVS, Walgreens) I found the conditioner at Walmart. I thought if it's never in stock it must be good- and it is! Hair feels semi-healthy (cut of my ends will help a lot!). Next up: Hair Treatments are just as important in my opinion. 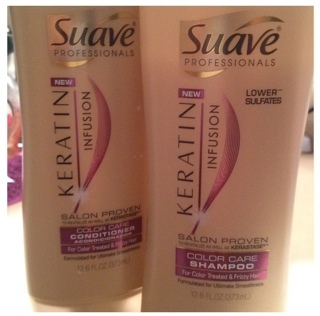 Currently in my rotation are, Suave Keratin Infusion Leave-In Conditioner- this stuff is amazing!! 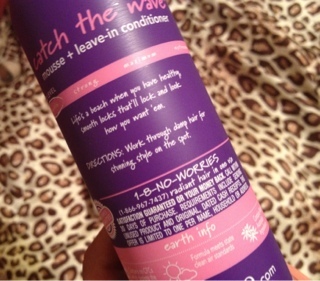 I've tried several hair serums/leave in conditioners. Since using this Suave one I can brush my (thick, unruly) hair without any pulling! My hair is on the dry side, so I only wash it every 2-3 days- even in this heat it doesn't go bad and smell awful (thanks to having it in a high bun most days) but I do like to keep it fresh with Pssssst Instant Dry Shampoo. I don't use many, but on the rare occasion hair spray is needed (for fly aways! )I have a bottle of Rusk deep shine oil Advanced Marine Therapy, this is absolutely non-sticky and smells so good! 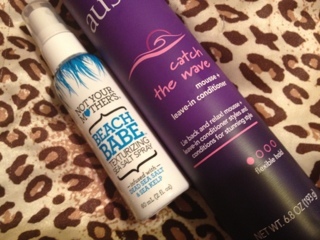 I also repurchased Not Your Mothers Beach Babe Texturizing Sea Salt Spray. I'd bought this before to see if it was a close dupe for the bumble&bumble popular Surf Spray- I think so and for way cheaper! CVS had the 2 oz on sale for $2.49! I spray it before bed and wake up with waves that look natural and even better on the second day! Last product is a new one. 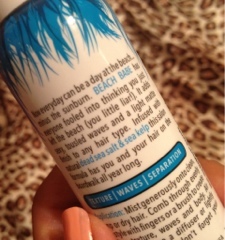 I saw Carly from purpleshampoo.blogspot.com, talk about: Aussie Catch the Wave mousse + leave in conditioner. Haven't had much luck with mousse (usually are sticky and make my hair crunchy) but Carly said it made her "Favorites list", and it was also on sale at CVS so I had to try it! Am so glad I did- I love it! I've only tried it this week but can tell a difference in both the texture and bounce of my waves/curls! Thanks Carly! Whew- looks like a lot for someone who thinks herself as low maintenance on the hair;) I do own a hair dryer and straightener, but it's been over 6 months since I've used either one! And so far my hair seems quite happy. I hope the hair cut works out! 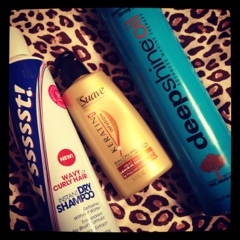 What's your favorite hair products? Anything I'm missing out on? Definitely going to try this- I have ombre hair at the moment and I've definitely noticed such a dis-improvement in the condition of my hair... but I love it so much I don't want to give it up just yet! I really like it! Last summer I had short hair and the ombré, so there wasn't much damage but this time when I had it done it was bad:/ if you try it let me know how you like it! I think the same as you.. you can find awesome Drugstore products for the hair.. anyways each hair works different with some products. Now that I've cut my hair and its pretty healthy almost everything works good but I really like L'oreal Elvive with royal jelly, it works awesome for my hair. I haven't tried the L'oreal one and like it too! I have sun-bleached beach hair that is ssssoooo dry and damaged. 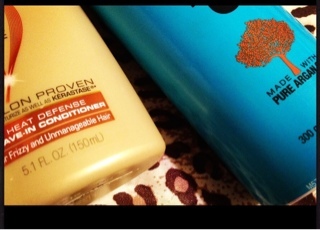 I've recently been using Klorane Mango Oil and Nexxus Split End Repair leave-in conditioner. Both are God-sends, but now my mango oil is about done :'( so I need to restock (expensive!) but I've been thinking about a Keratin regimen for a while now. I had to idea Suave had one! I'm going to have to try that out! So thankful for your review!